Internet Retailer Top 1000 clothing accessories e-tailer Phoenix Leather Goods, LLC (PLG) has revitalized American luxury fashion brand, CrookhornDavis (CD), just in time for the 2017 holiday season. With the assistance of namesake Edmund Crookhorn’s son, Michael, PLG will continue CD’s tradition of producing luxury men’s accessories made from the finest raw materials. Plainfield, IL – October 5, 2017 – Internet Retailer Top 1000 clothing accessories e-tailer Phoenix Leather Goods, LLC (PLG) has revitalized American luxury fashion brand, CrookhornDavis (CD), just in time for the 2017 holiday season. With the assistance of namesake Edmund Crookhorn’s son, Michael, PLG will continue CD’s tradition of producing luxury men’s accessories made from the finest raw materials. CrookhornDavis was founded in 1948 by World War II veteran Joseph Joanidy as the French American Group. The company was an importer of fine men’s accessories produced in France and sold under the brands L’Aiglon and Dore’ Dore’. Over the next 20 years, Joanidy traveled city to city growing the brand and distributing to only the finest stores such as Barneys, Neiman Marcus, and Saks Fifth Avenue. Sensing a need to keep up with current trends, in 1968, Joanidy recruited Edmund Crookhorn & Nick Davis who quickly worked their way up the ranks of the company. When Joanidy retired in 1978, Crookhorn and Davis acquired the French American Group and relaunched it as CrookhornDavis. In 1988, Edmund Crookhorn acquired 100% of the company. In 1994, Michael Crookhorn joined the company and CrookhornDavis remained a strong luxury brand into the new millennium. Phoenix Leather Goods, known for its accessory outlet BeltOutlet.com, sensed growing consumer demand for high end men’s accessories. 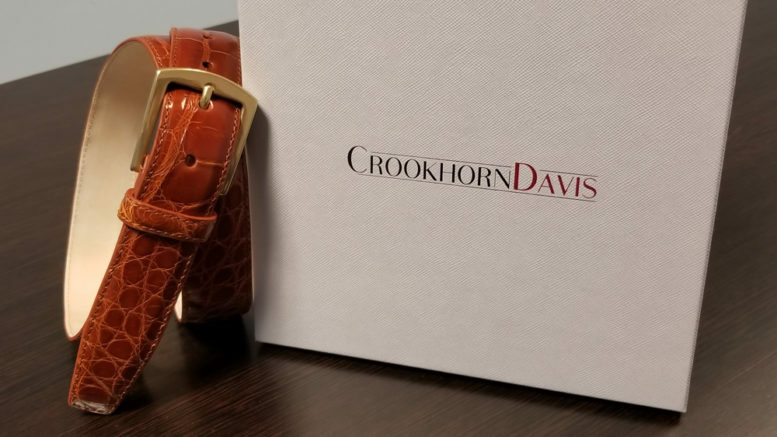 In 2016, PLG acquired the rights to the CrookhornDavis brand and hired Michael Crookhorn to modernize CD with a mix of exclusive accessories produced in the USA, Italy, Peru, and United Kingdom. The initial assortment includes luxury belts, braces, briefcases and socks for men. Phoenix Leather Goods, LLC was founded in Naperville, IL in 1997 as a small family business. Selling on eBay and flea markets allowed them to build enough capital to launch their own website in 1999, BeltOutlet.com. The company has grown from storing product in the family basement to expanding into a multi-unit office and warehouse facility. Today, PLG is an Internet Retailer Top 1000 e-tailer located in Plainfield, IL. Learn more at www.phoenixleathergoods.com and www.crookhorndavis.com. 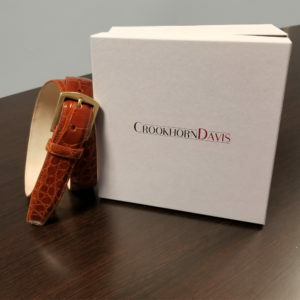 Be the first to comment on "Family Run Ecommerce Company Revitalizes American Luxury Clothing Accessory Brand, CrookhornDavis"